Welcome to KentuckyRoads.com. This web site contains information about Kentucky's roads and highways collected by Jeffrey Carlyle. It is not associated with any government agency. For more information about this website see here. 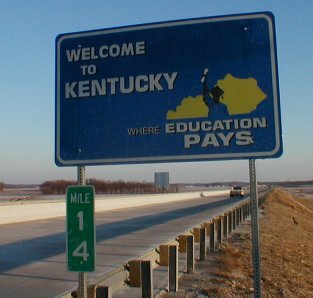 About this image: The sign to the left is an example of Kentucky's standard welcome sign. This particular sign is on US 231 at the south end of the William H. Natcher Bridge in Daviess County. 840 WHAS posted this video of a drive across the bridge on their Facebook page. HOPKINSVILLE, Ky. (Oct. 2, 2012) – Gov. Steve Beshear, joined by area legislators and state and local officials, today unveiled new highway signs announcing a higher speed limit of 65 mph on strategically located U.S. 68/KY 80 between Cadiz and Bowling Green. FLEMINGSBURG, Ky. – Motorists should watch for traffic changes on KY 11 in Bath County in the coming weeks as contractors have started work on a $321,000 pavement improvement project. JACKSON, KY – Residents of Magoffin County are invited to attend a public informational meeting to discuss a project to improve US 460 between the Mountain Parkway and KY 114 in Salyersville. The meeting will be held Thursday, May 24 from 5-7 p.m. at the Magoffin County Courthouse. It will be an “open house” format meeting with no formal presentation. Contains information about this website and it's maintainer, Jeff Carlyle. Also contains announcements about new features of the website. In the closing days of his administration, Gov. Patton renamed the Daniel Boone Parkway to the Hal Rogers Parkway. Pictures of I-75's crossing of the Kentucky River. The current bridge is actually three parallel bridges joined together. Pictures of the Glen Lily Road Overpass. It was awarded "Most Beautiful Bridge" in 1973. Links to information about roads and highways with a focus on the roads and highways of Kentucky. A collection of information about travelling in the Commonwealth of Kentucky including links to information on road conditions. Kentucky's second cable stayed bridge over the Ohio River northeast of Owensboro opened to traffic in October 2002.